With the craziness of the Superbowl, and the white flakes are just beginning Sunday, we were fortunate to have played all our VISL fixtures over the past weekend. Here is the breakdown of the action, and how it affects the overall landscape of Division 1 soccer on the Island. On Friday night, Gorge had little problem defeating Fernwood 5-2 thanks to goals from Mike Dunham, Mike Moon, Zakaria Bougraine, Dominic Colantonio, and Jon Shah. Fernwood’s two counters came from Nick Graham and Ydrisa Da Silva. 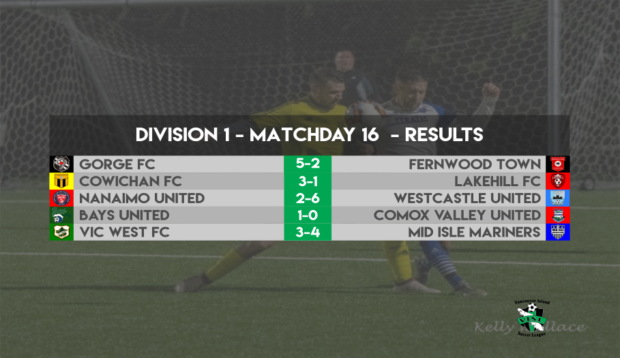 The Saturday night ‘Game Of The Week’ was a good one with Cowichan beating Lakehill by score of 3-1, to keep their place at the top of the standings as they chase the fivepeat. Cowichan’s goals came fromy Colin Knight, Craig Gorman, and Jose Muro, with the lone Lakehill goal scored by Blair Sturrock. Game MVP was Cowichan keeper Darian Achurch. Next up was Merle Logan Turf where visiting Westcastle defeated Nanaimo by a score of 6-2. 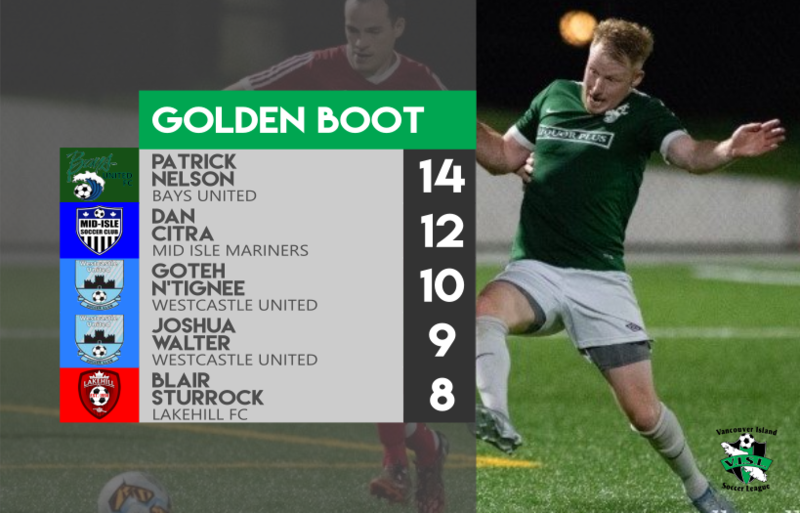 Joshua Walter, Simon Stacey, Goteh Ntignee, Jonathan Walter, and a pair from Boland Lekeaka saw Westcastle keep the pressure on Cowichan at the top. Nanaimo answered with goals from Daragh Fitzgerald and Taylor Arbour. Saturday night at Oak Bay High had Bays Utd slip past Comox by score of 1-0 thanks to the only goal of the game from Chris Peereboom. Recording the shutout for Bays was Keeper Andrew Flello. The final game of the weekend was a thriller at Finlayson Turf where visiting Mid Isle defeated Vic West 4-3. A pair of Ryan Andre goals led the way for Mid Isle, with Miguel Banting and Fraser Rideout also on the scoresheet. Vic West’s goals were courtesy of Riley O’Neil and a Nicolas Budisa brace. There is a separation at the top now, with Cowichan and Westcastle leading the pack. They still have two games left to play against each other, which will have a lot to say about the finals standings and should guarantee a couple of crackers. However, Nanaimo will have something to say about it next week as they face the division leaders and can upset the apple cart somewhat. Mid Isle are also still in the mix, but will need more than just their own results to get them to the top. They will need some help from other teams if they look to win the Garrison Cup. Nanaimo and Lakehill have been eliminated from a first place finish, but will still look to finish in the top four. The bottom of the table is not totally set either. 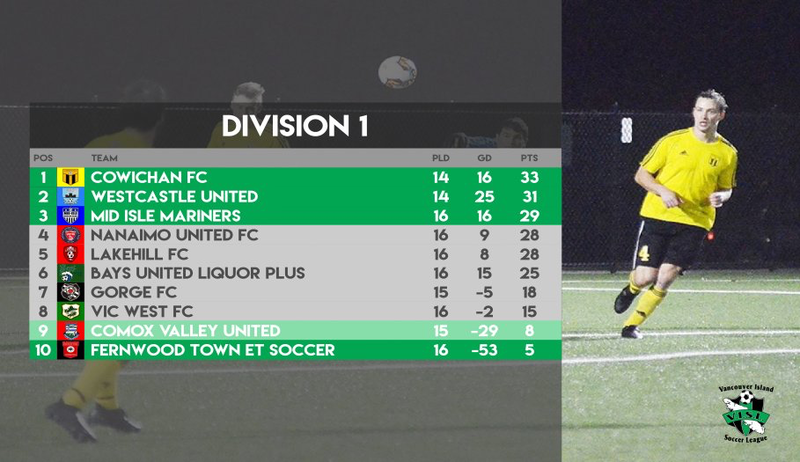 We know Fernwood will stay in the relegation zone, but where Comox will finish is still to be determined. 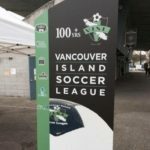 You can find all the latest results, standings, and fixtures, on VISL.org.